The Labour Party have released a poster to coincide with the UK coalition government’s budget. 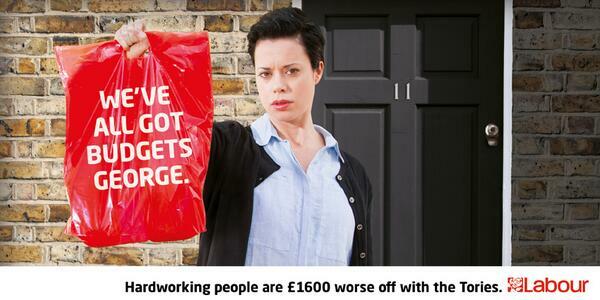 Interestingly, the Labour Party have created a new word for the poster ‘hardworking’. * Or, perhaps the poster is only running in the little known town of Hardworking, a town where people only speak in Labour Party buzzwords and sound bites? Considering the Party’s finances this is not completely ridiculous. The poster is ok. It makes sense (if you forgive the typo), it’s timely and contains an idea. Can I see many people sharing it or journalists writing about it? No. It’s just not that interesting. The battle lines for the UK general election 2015 are very clearly drawn and this poster clearly shows the Labour Party’s strategy: position Labour as the party for those still feeling the squeeze. The challenge now is to produce some exciting creative that breathes air into that strategy and inspires supporters and undecided voters. This execution doesn’t quite hit that mark. *Update* I’ve been reliably informed by many, many people that ‘hardworking’ is not only a word but indeed the correct spelling of the adjective of hard-working. I should really check these things before mouthing off. Apologies to the copywriter, the account man and the client.